Mold Remediation Pros is a expert mold remediation Smyrna GA provider. We offer mold inspection, cleaning, testing, remediation, and warrantied removal. Mold isn’t just a nuisance. It’s relentless and aggressive and can take over your home or business before you know it. Any time water is introduced into your building structure; whether it’s a home, office, or warehouse, there is an opportunity for mold to form. Within just two to three days of standing water and the formation of mold, the allergens in the air can begin to irritate your breathing. Left untreated, the mold can contribute to even more severe, long-term health problems. The first thing to do when you suspect that there may be a presence of mold is to call and speak to one of our mold remediation specialists. We will be able to start the process of helping you take care of your mold problem and work with you to organize necessary testing to identify the type of mold, and exactly how much of it there is in your home or business. If the mold is already clearly visible, then it’s likely no testing is needed, and remediation can begin immediately. Contact us if you’re able to see the mold in your home or business, and we’ll get to work ASAP to help make sure the air that you breathe is clean and clear. There are four steps to approaching mold remediation, and each must be done correctly to make sure that your home or business is returned back to its original condition. Along each step of the way, the safety of you and your loved ones is paramount. We do the best we can to not displace you from your daily routine. Mold Assessment – The assessment is actually broken into three separate evaluations. One prior to the remediation to assess the extent of the mold. One during the remediation to be sure that the entire affected area is being treated, and one when complete to be sure the job is complete. Contamination Confinement – We take measures to be sure that the mold does not spread any further once we begin work. We never want to be chasing the spread of mold during the removal. Mold Removal – We work to get 100% removal of any mold infestation that is present in the building. Moisture Control – Moisture is always the source of mold growth. We find that source and fix it so that mold will never return. We take pride in our work and follow each step through to completion to be sure that you do not have any recurring mold issues. When you hire a professional mold remediation company in Smyrna GA, you can literally save your home or office from being taken over. No matter the type of mold, we find it, fix it, and put an end to it ever returning. Removing the visible mold is the first step. However, we also address the issues you can’t see. The air you breath may be filled with invisible mold spores and requires specialized equipment to remove any airborne spores. 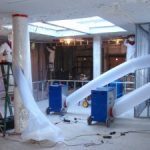 We utilize professional HEPA air scrubbers and air exchangers which clean the air, scrubbing it of even the most microscopic debris, and exchange it for fresh air via a vent system. Depending on the evaluation of your mold issue, we may recommend that you have the HVAC system, or at least the ducts themselves, cleaned as well. The last thing you want is to go through a full mold removal and remediation process only to have residual spores in your ducts! Once the mold removal process is 100% complete, the area that was effected can be repaired or replaced as needed. Enlisting the services of a trained professional will ensure that the process is complete. We work to return you back to normal life as quickly as possible! Mold Remediation Pros is centrally located near Smyrna GA with attractions that consist of the Cobb Travel And Tourism a information bureau and near the Tolleson Park in Smyrna GA where you can take the family for the day to cool off at there swimming pool along with areas to play sports with friends and family.